Inexcusable Twitter Behavior: Why Aren’t We Beyond All of This? I follow a lot of blogs on technology, libraries, librarians and social networking. One of the blogs I follow is the blog of danah boyd. danah boyd is a social media researcher at Microsoft Research New England and a Fellow at the Harvard University Berkman Center for Internet and Society. She is probably the leading researcher and scholar on the subject of youth and social networking. I have no idea how many talks and presentations she has given; but, I can only imagine that it is A LOT. Last week, she was giving a talk at Web2.0 Expo. This is a conference for web geeks and those interested in web geekery. You can read her post on what happened here. I’ve always had tons of respect and admiration for her work anyway and for being so active and present in a man’s world; but, that post has elevated my admiration even further. To quickly summarize: The organizers of the conference decided that a Twitter stream should be visible behind the presenter. So, while she was speaking, there was a live stream projected behind her of what people in her audience were saying about her talk. The Twitter stream behind her turned nasty when the audience started making comments about her presentation style and apparently (though I have not seen all the tweets) personal attacks. By her own admission, it was not the slickest speech. I went on YouTube and watched it. It actually was not that poorly presented in my opinion. She definitely spoke too fast; but, I’m certain that having the audience burst into laughter when you haven’t made a joke is unsettling and I too would race to the end. At the bottom of her blog post there are numerous comments and a couple of the commenters talk about the “social contract” between presenter and audience. This is an important part of the conversation. Is there a contract between presenter and audience? When is it okay for the audience to be equal participants? Is it ever okay for the audience to become the focal point? Why do we go to hear speakers? All these and a million more questions have been raised by Ms. boyd’s experience and her sharing of this experience with the larger, connected world. To me, all the debating in the world can go on about whether broadcast Twitter streams have a place at conferences while people are presenting and/or about whether what happened to danah boyd was a legitimate use of Twitter or a bunch of people angling for exposure, trying to one up each other with deeper and wordier insults; but, the core issue is humans treating other humans with decency and respect. When did it become okay to take fidgeting during a “boring” lecture to delivering public and personal attacks on the presenter? This is not okay. There is an appropriate time and place for CONSTRUCTIVE criticism of a lecture; but, during a presentation is not one of them. It only ends up being disruptive and rude. If you wouldn’t stand up in the middle of a lecture hall and yell it, you probably shouldn’t tweet a personal attack. The sad part of all of this is that we’ve completely lost her message which is incredibly thought provoking. I urge you to read the transcript of her talk. She is one of our brightest minds and what she has to say is relevant and insightful. I found her closing comments ironic in light of what happened. As we continue to move from a broadcast model of information to a networked one, we will continue to see reworkings of the information landscape. Some of what is unfolding is exciting, some is terrifying. The key is not be all utopian or dystopian about it, but to recognize what changes and what stays the same. The future of Web2.0 is about information flow and if you want to help people, help them reach that state. Y’all are setting the tone of the future of information. Keep it exciting and, please, recognize the power that you have! Thanksgiving is one of those holidays that has a mythical and debatable origin. Not all Americans view Thanksgiving as a joyous, warm and loving holiday to be spent with family. The Pilgrims, Puritans, and Separatists were not all here for religious freedom, though if memory serves, that is what I learned in school. We actually have a bloody history with different European peoples killing each other on American soil before they finally turned their eye towards native peoples and began war after war that included genocide and land stealing. Here we are hundreds of years later with cartoon turkeys, black Friday, family squabbling all centered around a gluttonous meal. I know numerous people that dread extended family gatherings because of political arguments, family gossiping, disapproval of lifestyle, appearance, religion, choice in partner or because they orchestrate a giant meal with little help or thanks. How can we make the most of this day? I have some suggestions for things I’m going to try this year. 1. Set your intentions right after waking. Think about how you want the day to go and how you want to receive any unpleasantness. Write down three things you’re grateful for having in my life. 2. Make sure you exercise. I’m exercising myself and my dog. I’ll be calmer and so will he. 3. Be direct and honest. If the conversation turns toward a topic sure to bring on an argument, try to steer it by being blatant: I don’t think discussing Obama’s Health Care Plan is a very good idea. Let’s just stick to topics that won’t start a big fight. I’ve tried this tactic and it actually works. There are usually a few last second comments thrown in; but, it settles it down because it is not an unreasonable request. 4. Help the host. Sometimes help is setting the table or cleaning up afterward and sometimes help is keeping Uncle Joe from eating all the stuffing before it’s even served or keeping Cousin Fred out of the kitchen where he is an annoying know-it-all. 4. Steal Thanksgiving back from the history books that perpetuate a myth and from the advertisers who see it as the start of a consumer binge. Create new rituals that give thanks and forgiveness to those you love. 5. End your day with a stroll or some indoor quiet time and reflect on the day. Write down 3 more things you’re grateful for. If you celebrate Thanksgiving, enjoy it. I am spending it with family and expect to have a lovely time and if I’m lucky, I’ll get to see the herd of wild turkeys that passes through my parent’s property in the late afternoons. I love those turkeys. There are sometimes up to 17 of them and they are scruffy and wild and noisy, nothing like our Thanksgiving turkeys. I love watching them. When Karen Armstrong won the TED Prize in 2008 she used her wish to call upon the TED community to help her create a Charter for Compassion. Her dream has been realized with the birth of the TED project on November 12, 2009. It is an interesting endeavor and one I will be watching closely. Before the launch they released 6 videos from people of different faiths to comment on compassion. At the very least, this awesome and inspiring project should propel us into much needed discussions in our communities. Like kindness, I think sometimes compassion gets an eye roll or is seen as some bizarre form of weakness. Spend some time thinking about compassion this week. Tell people about this project. Talk to your friends and family about it. Put yourself in another’s position, think about what is motivating them, listen to their grievances. This notion was brought home to me over ten years ago when I stumbled upon a Buddhist story about an empty boat. In the next post, I will tell you the empty boat story and how it changed my life. 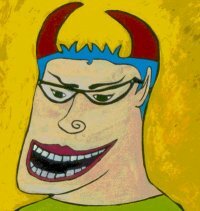 The painting above is called Devil Girl and started out as one in a series of paintings I did about my ex’s alter egos; but, the further I got into it I realized I was painting a self portrait: My own alter ego. I use this self portrait frequently as my online avatar. It is this association that confuses people. “But, you’re all about people being kind…I don’t get it.” That is a statement or some variation, that I have heard many times when people see Devil Girl. From Buddha all the way up to and beyond the philosophy of Carl Jung, great thinkers have tackled the question of the human dark side. I’m not a big reader in the field of psychology; but, I believe Jung called it the “shadow side.” This is the side that gives us negative and sometimes disturbing or violent images/thoughts when we are angry/hurt. In the movie, Fried Green Tomatoes, there is a scene where Evelyn Couch, brilliantly played by Kathy Bates, has a parking spot stolen by two young, pretty and rude girls. She waits until they get out of the car and then rams their car with hers (several times). This is an example of when a thought and/or urge from Evelyn’s shadow side emerges and she allows it to take over. We cheered her on when she did this; but, obviously there are many dark thoughts that pass through our minds that we would NOT want to act on. I used to not really believe that a dark side component existed in all of us. I thought that you could “better” yourself to a place where you were free from negative thinking. But, I met a Buddhist psychologist who explained different philosophies on our shadow side and I began to see that denying our dark sides is not really the way to go. I think it creates a tension where one does not need to belong. Plus, it is setting you up to feel failure because it is just impossible to erase all negative thoughts from our brains. She told me that by embracing our shadow side, examining it and coming to understand it, we will begin to be able to accept it and be in a better position to let it go instead of letting it cause suffering in our lives. Instead of resisting these thoughts what if we acknowledged them: “Well, there is a negative thought.” Inspect it: “Where is it coming from? Why am I thinking it? What is it doing to me?” And let it go: “Okay. I had a negative thought. It doesn’t make me evil or a bad person. I’m moving on now.” You let the thought go and consciously move your mind away from it. In my own experience, I have noticed that I hold onto the negative thinking for less time now. For example, instead of allowing myself to churn an angry thought over and over in my mind, fueling it, I acknowledge it (label it: angry thought) and then I can quickly figure out where it originated and what it’s doing to me (it doesn’t feel good that’s for sure) and let it go. In a past post I talked about road rage. I have a lot of angry, negative thoughts when people do stupid things on the highway. Labeling those thoughts and letting them go quicker and quicker will only benefit me physically and emotionally and benefit my customers who I’m about to spend the day helping. The more practice you have doing this the more it will become automatic. I barely have to put effort into the labeling part anymore. As soon as I think pissed off thoughts, my brain is labeling: anger, anger, anger and I am already moving away from them. Acceptance that we have these thoughts also can free us from the shame or guilt over having them in the first place. It is a part of our human psyche to have these thoughts; but, we can cultivate practices that reduce the suffering to ourselves and the spreading of the negativity to others. And for this blog, that is the important point of this post. If you suffer less, if you have less bitterness and anger (not because it doesn’t exist but because you let it go quicker), I guarantee that you will be happier, more light hearted and better able to help customers and interact with the people in your life in a kind and compassionate way. Devil Girl is in me. If I ignore her, there is no telling what sort of trouble she’ll get into behind my back. If I acknowledge her and embrace her, I can soften the impact she has on my world. Our happiness, our behaviors, our attitudes are all our responsibility. I have a challenge for you. Commit, for one day, to keep track of negative thoughts that pop into your head and label them. You could do this in your head or even write them down on paper. Don’t judge yourself for the existence or intensity of the thoughts (even if it is a momentary desire to inflict pain on someone). Pretend you are completely removed and just taking inventory. What did you find out? What are you going to do about it? Update 11/13: A Rabbi Harold Kushner quote has been brought to my attention. “Good people do bad things ….. If they weren’t mightily tempted by their yetzer ha’ra [will to do evil], they might not be capable of the mightily good things they do.” from Living a Life That Matters.